Even if you are not focused on being fashion forward, your clothing still matters a great deal when you are a fan of spending time in the great outdoors. Our selection of tactical jackets has something for every outdoorsperson and every season, so settle in and check out our selection to help you figure out your next tactical gear purchase. Are you looking for an outer layer to fight off the elements? Or an inner layer to provide subtle protection, comfort, and warmth? Regardless of which mode of defense is on your radar, we have highly rated selections from your favorite brands, like Browning, Blackhawk!, Woolrich, and Frogg Toggs. Our catalog of jackets includes protection against all temperatures, as well as full suits for whole-body coverage. We have parkas, rain jackets, down coats, and more. Choose from a wide array of colors and patterns to find the jacket that fits your needs most closely. GrabAGun keeps a wide variety of items in stock so you can always find an option to suit your needs and the peace of mind of purchasing the item from a dependable company. We have jackets with hard-to-live-without features like handy interior zip pockets, zip-off sleeves for maximum utility, all-weather hoods, and custom stuff sacks—once you choose one of these, you will wonder what took you so long. Having the right apparel can be the difference between a decent hunting trip or target shooting outing and an unforgettable one. 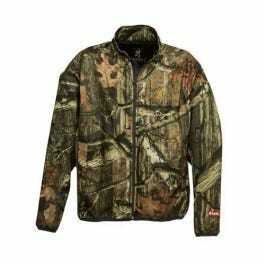 Upgrade your gear today by grabbing your next favorite jacket right here on GrabAGun.